Sunil Kumar and Sangeeta Yadav stay in Delhi with their three children aged 13 and four (twins). They get a combined monthly salary of Rs 5.81 lakh, which includes a rental income of Rs 10,000. The couple owns three houses and an ancestral plot, which are worth Rs 5.4 crore. Two of these have been bought as investment with loans worth Rs 1.1 crore. After considering all expenses, the couple is left with a surplus of Rs 1.8 lakh. Their goals include building an emergency corpus, saving for their kids’ higher education and weddings, buying a car, taking a vacation, retirement, and an additional corpus for the kids. Dinesh Rohira of 5nance suggests that the couple build the emergency corpus of Rs 5.5 lakh from their cash, and invest Rs 40,500 for three months in a liquid fund. Next, they want to take a Rs 5.4 lakh vacation after a year, which can be funded from their debt fund. For the Rs 59.8 lakh SUV they want after three years, they can start an SIP worth Rs 1.8 lakh in large-cap funds. This can be raised to Rs 2.5 lakh when the emergency corpus is built and after a rise in salary. 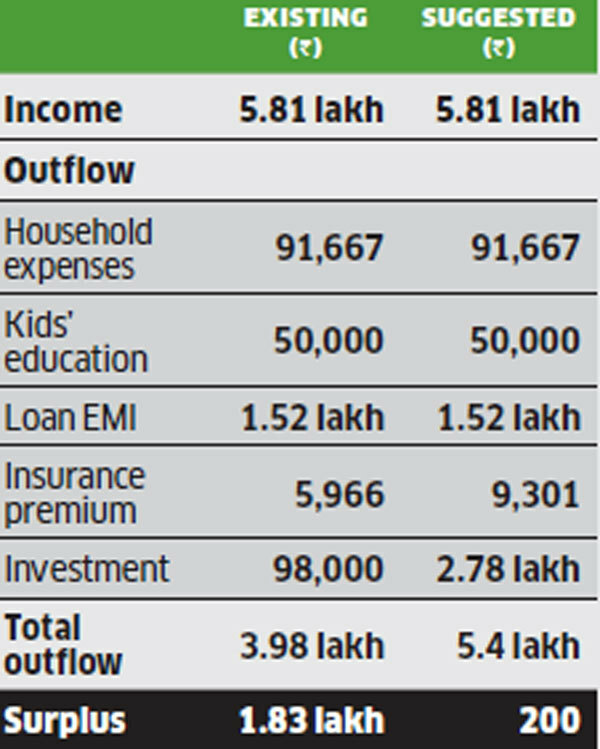 To amass Rs 36.6 lakh, Rs 58.4 lakh and Rs 1.1 crore for graduation, post graduation and wedding of the first child after four, seven and 11 years, respectively, they can assign a portion of their equity and debt funds, stocks and Sukanya scheme. For the first twin’s graduation, post graduation and wedding in 12, 16 and 20 years, they need Rs 78.4 lakh, Rs 1.3 crore and Rs 2.4 crore. For graduation, they can allocate their fixed deposit and stocks; for post graduation, they can start an SIP of Rs 27,000 after two years; and for wedding, they can start an SIP of Rs 15,500 in a diversified equity fund. 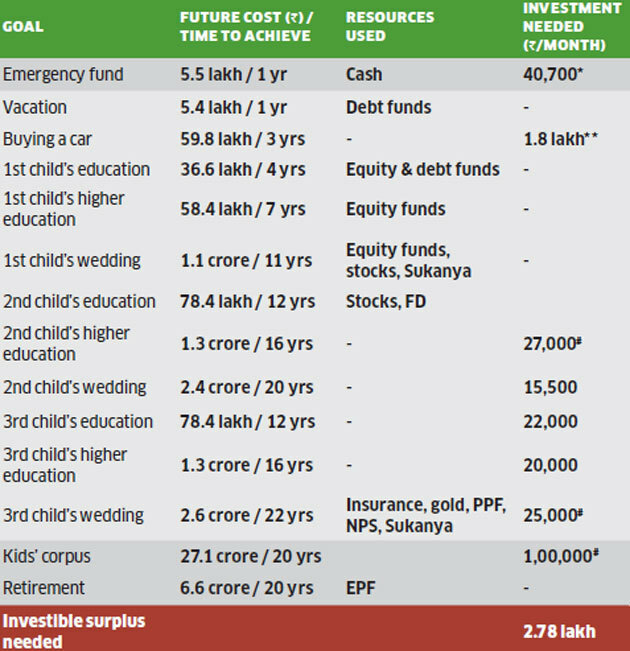 For the second twin’s education and wedding corpuses, they can start SIPs of Rs 22,000, Rs 20,000, and Rs 25,000 in diversified equity funds. For the kids’ corpus, they can start an SIP of Rs 1 lakh in a diversified fund after two years. * Investment for this goal is only for three months. # Investment for these goals will begin after two years. ** Investment for this goal can be increased after contingency corpus is built and after rise in salary. Annual return assumed to be 12% for equity (less than three years), 15% (more than three years), and 7% for debt. Inflation assumed to be 7%. For retirement in 16 years, the couple will need Rs 6.6 crore, which can be funded by the EPF. 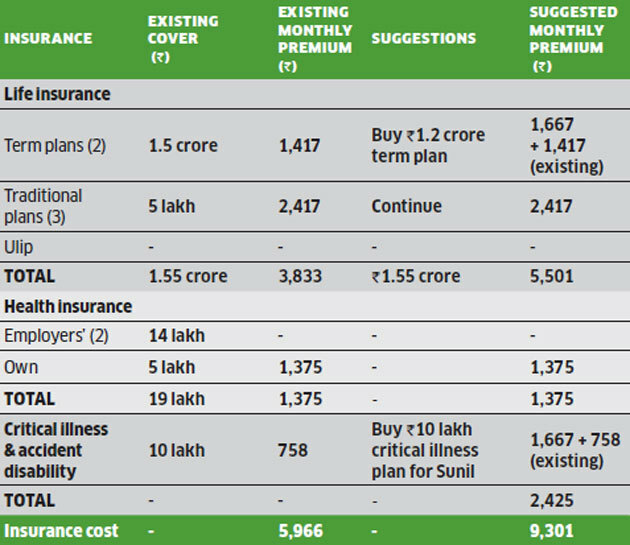 For life insurance, Sunil and Sangeeta have term plans of Rs 50 lakh and Rs 1 crore, but Rohira suggests an additional term plan of Rs 1.2 crore due to their loan liability. They should also retain their three traditional plans as debt component. The couple has a medical cover of Rs 14 lakh provided by their employers and a Rs 5 lakh family floater plan of their own. This is sufficient for them, but Sunil should buy a Rs 10 lakh critical illness plan at Rs 758 a month.